Gracies Cafe coffee bar and stellar employees. Gracie’s Café is a social enterprise of St. Leonard’s Ministry (SLM), an organization that provides comprehensive residential, case management and employment development services for formerly incarcerated men and women. 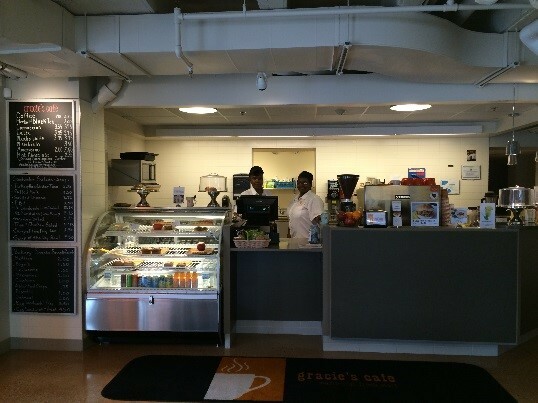 Partnering with SLM’s culinary training program, Gracie’s Café was opened in September 2013 to provide individuals with real world, culinary and business experience. In 2013 CVP loaned SLM $50,000 to ensure the steady operating of the business. Bright, inviting and open interior of Gracie’s Cafe. 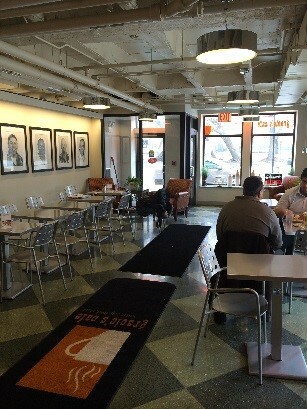 Today, walking into Gracie’s Café, you immediately feel welcomed into this bright and inviting space. The employees are friendly and prepare fresh and tasty food. Since opening, thirteen individuals have successfully completed the training program and four individuals work in the café. Of the thirteen who have graduated, ten are employed in places like Pete’s Market, Eataly and Little Miss Muffin. While working at Gracie’s Café, individuals not only get real, hands-on work experience, they get paid while doing it. They are given the necessary tools and support to explore different parts of the culinary industry and ultimately gain full-time employment. Gracie’s Café is a wonderful place to drink a cup of coffee, eat a delicious sandwich, and most of all, support the hard work of these individuals and SLM. Go visit the café at 1517 West Warren today! Learn more about Gracie’s Café. 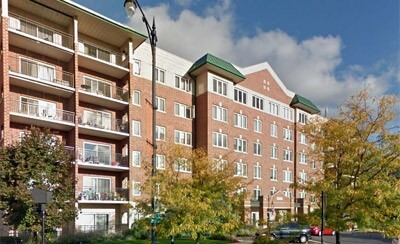 The Mayfair Commons senior building. The North River Commission’s (NRC) mission is to unite the community to improve the quality of life for all constituents by creating affordable housing, quality education, arts & cultural endeavors, open spaces, and stable neighborhood businesses. As part of a larger community development plan, NRC developed Mayfair Commons in the late 90’s, providing 97 total units of senior, affordable housing. In order to preserve the affordability of the senior housing, NRC requested a predevelopment loan of $100,000 in August of 2014 to help begin the preservation process. 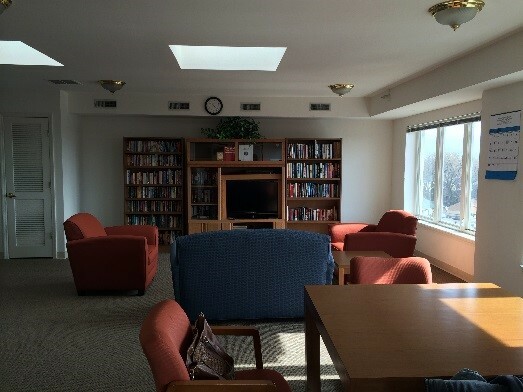 Beautiful and bright community room in Mayfair Commons. NRC is using the CVP loan to create a redevelopment team and a plan of action for the preservation process. Because this process involves many different players and complex layers of both Federal and State funding sources, it is often difficult to secure early financing at this stage of the project. 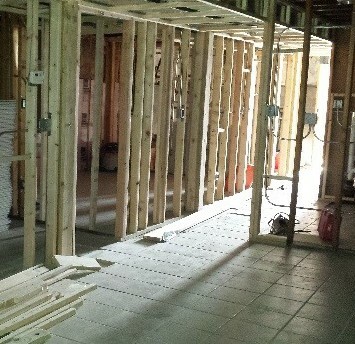 The CVP loan is enabling NRC to preserve the building’s affordability. When visiting the building, I had the opportunity to meet with Melissa McDaniel, NRC’s Program Director who is leading the way on this complex project. We sat in their beautiful community space while residents wandered in and out of the room, always smiling, and engaging us in conversation. It is clear that Mayfair Commons is creating community and providing much needed, quality, affordable housing for many seniors. Melissa shared that through the preservation process, they hope to update parts of the building, repair the roof and replace many electric and water fixtures with energy efficient models. Learn more about NRC and Mayfair Commons. 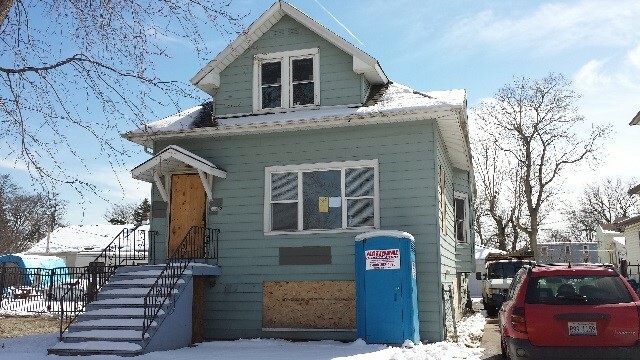 This entry was posted on Thursday, March 26th, 2015 at 3:20 pm and is filed under Community Ventures Program, Housing, JCUA Project and Campaign Endorsements. You can follow any responses to this entry through the RSS 2.0 feed. Responses are currently closed, but you can trackback from your own site.